Butterfly Reflections, Ink. 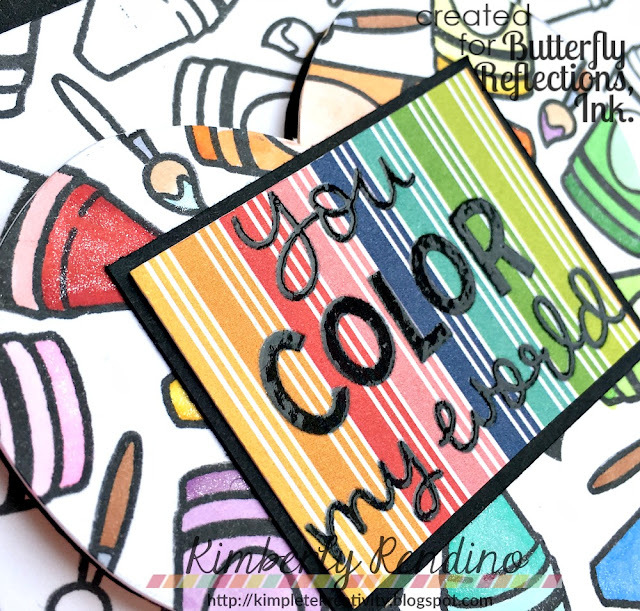 : Spotlight Coloring with Lawn Fawn! Spotlight Coloring with Lawn Fawn! Hello again, Butterfly Ink-ers! 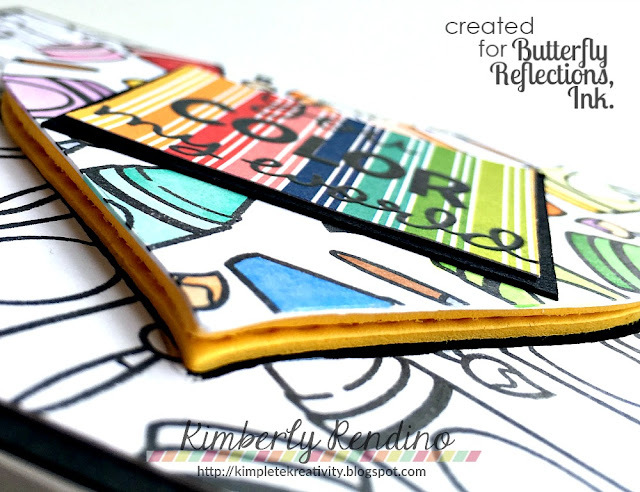 Kimberly here to share a card using some more Lawn Fawn goodness! I can't get enough of Lawn Fawn's cute stamps. Did you know you can pre-order the new release over at the BRI store? Pre-orders are open until tomorrow, July 28th! I did some damage, let me tell ya! Lol! 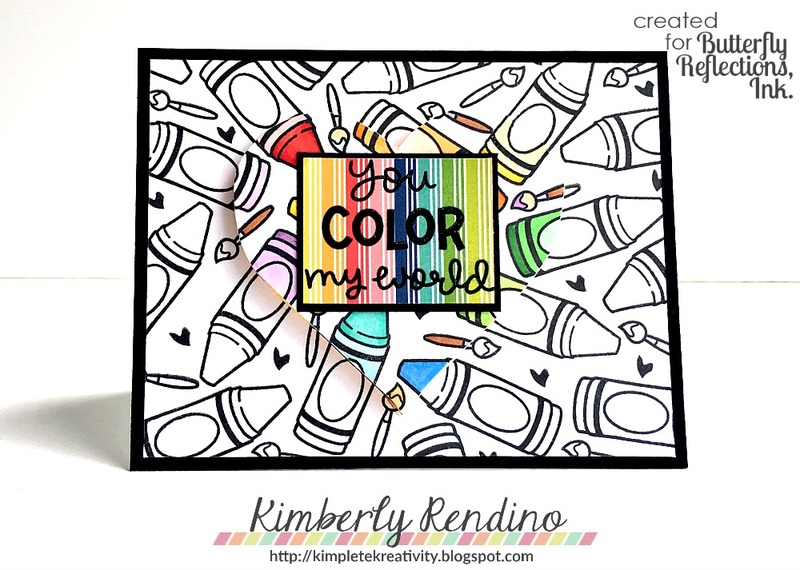 I wanted to do some spotlight coloring with the super cute Color My World Stamp set, so I began by tracing a heart shape onto my cardstock lightly with pencil. 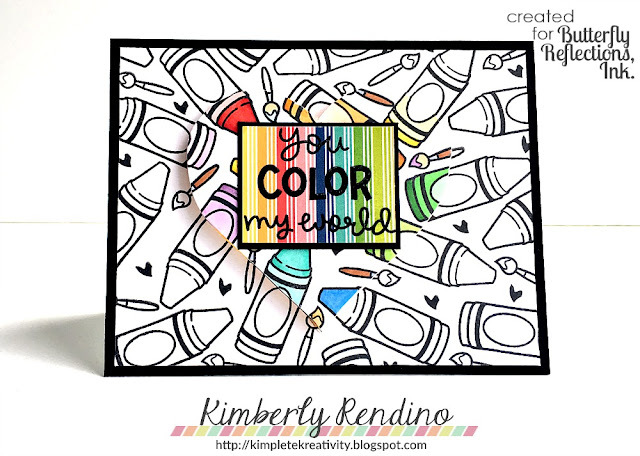 I stamped the crayon from Color My World and the paintbrush and heart from Chirpy Chirp Chirp all over my cardstock, being sure to stamp all along the edge of my traced heart so as to keep the shape recognizable. Once I was finished stamping, I cut out the heart shape with an X-acto knife and colored it in with Copic markers, adding a bit of glitter with a Spectrum Noir sparkle pen. I cut two more heart shapes from a piece of yellow fun foam using my X-acto knife, and then mounted the colored piece on top of them for some fun dimension. I love how the yellow peeks through on the sides! I mounted the cardstock piece to a piece of black cardstock, and then replaced the heart back in it's spot. The sentiment was stamped on a piece of paper from the Fun in the Sun paper pad and heat embossed. To make it stand out a bit more, I mounted it to a piece of black cardstock before adhering it in the center of the heart. I hope you've enjoyed my card today! See you again next week!